Matti Zaklikovsky is lifted during her bat mitzva celebration. Mattil Rozensztajn Zaklikovsky lost most of her family in the Holocaust but survived because a courageous family in her Polish village risked their own lives to shield her from the Nazis. However, in the decades of communist rule that followed, the Zaklikovsky family had been unable to locate the family of rescuers to thank them for saving Mattil, the youngest of nine children; her father Abram; and her brother Yechiel, the oldest child in the family. They were in hiding for four years. Mattil’s mother, Miriam, and her seven other siblings, who hid in other locations in the village of Tomoszowice, were discovered and killed or sent to concentration camps where they later died. 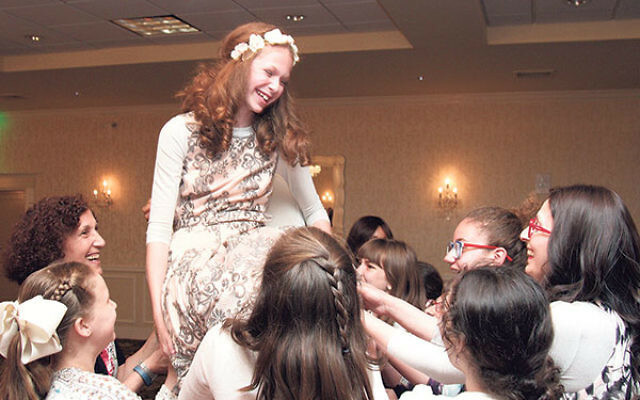 When it came time for her great-granddaughter and namesake, Mattil Zaklikovsky of Monroe Township, to become a bat mitzva, she decided her tzedaka project would be to track down the family so they could at last be thanked. Matti, the daughter of Rabbi Eliezer and Chanie Zaklikovsky of the Chabad Jewish Center of Monroe, succeeded in her quest. With some significant help on the ground in Poland, the 91-year-old daughter of the Paluch family — who helped her parents hide the three Jews in the attic of their home — was found. During a bat mitzva celebration June 21 at the Holiday Inn in East Windsor, a plaque was presented to Agata Radkowska of Lublin in recognition of the help she gave in locating that daughter, Genowefa, who lives with her son and daughter-in-law. Matti said the successful months-long search left her feeling “excited, inspired, and happy” and proud that she could pay homage to people who committed a heroic act. The descendants of Mattil and her husband, Dovid Henoch Zaklikovsky, an Auschwitz survivor who settled in Brooklyn, and Yechiel, who went to Israel after the war, now number more than 100. Abram Rozensztajn remained in Lublin, working for the city’s only surviving synagogue, until his death in 1951, said Rabbi Zaklikovsky. So instead of a DJ and dance music, her celebration included a film about her successful search. Matti’s research was furthered by the uncovering of documents connected with a suit filed by Abram Rozensztajn after the war against the Tomoszowice mayor and townspeople for their complicity in the deaths of his family. The Zaklikovskys learned the mayor had warned the Paluchs not to take in Jews. “I always heard stories from my grandmother about sleeping in the attic and was always amazed at her willpower and determination to survive,” said Rabbi Zaklikovsky. He said he heard that even after Jozef, Genowefa’s father, saw a neighbor shot for harboring a partisan, he was undeterred. Radkowska told the bat mitzva guests that she and a colleague spent months doing research and going house to house in the village. They finally arrived at one home where an elderly woman came to the door and told them it was her family who hid Mattil. The talk between the two women ended, said Radkowska, when Genowefa’s son and daughter-in-law came home and forbade further conversation. The family continued to refuse entreaties to meet Radkowska, who said she had given up, but “Rabbi Eliezer and Chanie asked me to try one more time. So I went and brought flowers and expressed gratitude on behalf of the Zaklikovsky family” and the family finally relented.